NASA’s Cassini spacecraft has made its first dive past one of Saturn’s outer rings, beginning the final chapter of its mission. Cassini skimmed Saturn’s F ring, the outermost of the planet’s visible rings, at a distance of 11,000km (6,800 miles) according to NASA, beginning the first of 20 orbits during which it will study the rings. "It's taken years of planning, but now that we're finally here, the whole Cassini team is excited to begin studying the data that comes from these ring-grazing orbits," project scientist Linda Spilker said. Located 91,000km from Saturn’s cloud tops and at 500km wide, the F ring is one on the planet’s most active, bounded on the inside by the moon Prometheus and on the outside by Pandora. “This ring is ever-changing, with bright streamers and tenuous filaments sometimes flowing out from it. At other times, the moon Prometheus dips in and out of the F ring, creating channels in the ring material,” Spilker said. The first pass was used to focus on Cassini’s engine and transmitting radio signals, with future passes expected to produce the most detailed images of the rings ever seen. 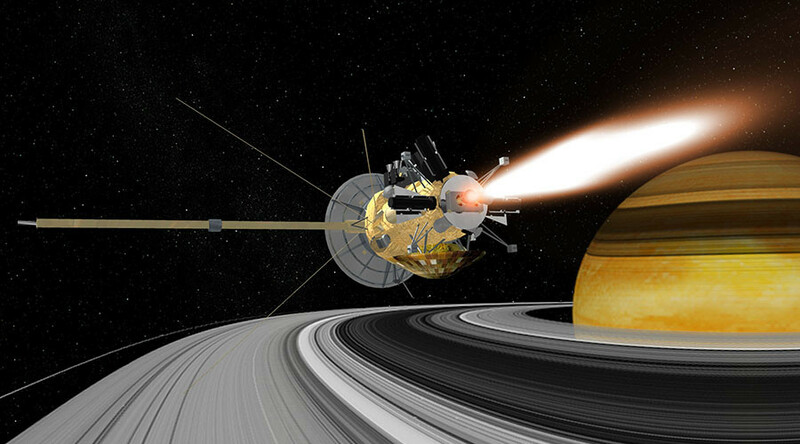 An hour before Cassini began its historic crossing it burned its engine for six seconds, sending it on a trajectory towards the ring-plane. It will take one week for each orbit of the F ring before it concludes this stage of its mission at the end of April 2017. It will then venture closer to Saturn than ever before, entering the 2,400km-wide gap between the innermost ring and the planet. There, it will make 22 plunges by the rings before it begins its final journey, plummeting towards the planet while sending back as much data as possible until signal is lost. During its mission Cassini hopes to shed some light on Saturn’s hexagon, a six-sided jet stream on the planet’s north pole which has baffled scientists. “We still don’t understand how the hexagon is maintaining its non-circular shape. It is unique in the solar system,” according to Spilker. Scientists also hope data collected by Cassini will help settle the age-old argument on whether Saturn’s rings are as old as the planet or were formed later by a stray moon that was destroyed when it ventured too close to the planet’s gravitational pull.